At Bob’s Discount Furniture, we care about our customers and we deeply value your feedback and reviews. Our company was founded in 1991 on the principles of honesty and integrity, and that’s how we treat our customers and our employees. That’s been the “Bob’s Way” of doing business for over 25 years. We simply believe that you deserve quality furniture and superb service, all at an affordable price point. Your furniture should be both comfortable and stylish, and we offer a wide selection to suit a variety of tastes. The best part? We cut out the middlemen and our buyers work hard to find you the best possible deals - no phony gimmicks or sales tricks needed. We carry living room, dining room, and bedroom sets, as well as office furniture and mattresses, and a variety of other home accessories. 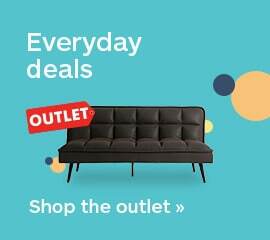 With Bob’s Discount Furniture, there are two great ways to save -- you can shop the My Bob’s Outlet online for the best deals, or visit our Outlet section in-store! Furniture inventory for the Bob’s Discount Furniture Outlet is always changing, so it’s best to check often because these amazing values sell out quickly. We want you to have the best possible experience when it comes to furnishing your home, from our in-store “service with a smile” to the moment your furniture arrives at your door. You’ll find complimentary treats in all of our stores at our in-store cafes. From cookies and ice cream to gourmet coffee, there is something for the whole family to enjoy. At Bob’s, we care about helping our communities too, too. That’s why any donations made in our cafes are matched 100% by us and go directly to charity. Bob’s Discount Furniture has always made giving back a priority, whether it’s supporting a national cause, partnering with your favorite sports teams, or reaching out to important local organizations through our Random Acts of Kindness. We donate over $2.75 million every year and we couldn’t do it without you. We have over 100 stores in 16 states and counting. Thank you to all of our loyal shoppers for helping us grow. Your feedback makes us better every day. Check out what some of our customers had to say, and see how you can share your experience with us below! Want to review Bob's Discount Furniture? Here's how! To leave a review, visit the Bob's Discount Furniture Better Business Bureau profile, where we are a BBB accredited business with an A+ rating. Are you a Bob's Discount Furniture employee? Visit us on Glassdoor! Want to work with us? Find open job listings and even more reviews on Indeed! Get inspired by the value at Bob's Discount Furniture!